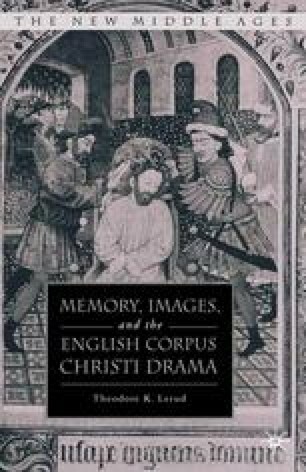 Based, then, on the evidence of memory theory and its importance in the framing of images, and the links we have seen in liturgical drama, we would expect that the Corpus Christi cycles would incorporate, continue, and develop this model. As such, the pageants would present figures in conventional iconographic postures against frames or backgrounds calculated to lend power to the Corpus Christi plays as an elaborate communal memory system. Further, we would expect the places where plays are performed to have been of major significance as part of the image of the production, as significant town structures and spaces serve to frame the incidents of the pageant. As in the illuminations in Books of Hours and other contemporary manuscripts, figures in the plays are presented in contemporary costumes and configurations, with town spaces, appropriately marked off during festival time, serving as backgrounds. Such a system, I believe, makes the cycles more than an antiquarian exercise repeated year after year and serves to account for their approximately 200-year run as a central cultural phenomena in late medieval English towns.